A celebration of the UK's largest and highest National Park, The Cairngorms in Winter with Chris Townsend takes the viewer on a spectacular 96 minute journey through awe inspiring scenery in the heart of Scotland's mountains. 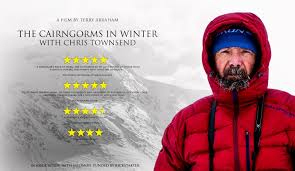 Accompanied by an evocative musical score from Freddiehangoler, Terry Abraham's feature-length debut reveals the grandeur and majesty of the Cairngorms through the eyes of local resident and internationally respected backpacker and author Chris Townsend (author of 17 books including the best-selling The Backpacker's Handbook). From the ancient Caledonian Pine forests of Glen Feshie to the bleak windswept plateau of the Moine Mhor and the monumentally precipitous flanks of Cairn Toul, The Cairngorms in Winter is a visual and audio feast that sets the benchmark for independently produced outdoor documentaries. Funded through crowdsourcing leader Kickstarter and filmed in an almost continuous 4 month period in early 2013 the film reveals the glens and high mountains of the Cairngorms in the depths of winter like never before. From stunning sunsets on Ben Macdui to waist deep snow in the Lairig Ghru the sub-arctic environment of the Cairngorms takes centre stage throughout, its beauty and dangers treated with equal respect. Chris Townsend's decades of intimate knowledge of these Scottish mountains combine with Terry Abraham's no-compromise determination to capture the real heart and soul of his subject in a unique film which will inspire and delight both newcomers and seasoned veterans alike.